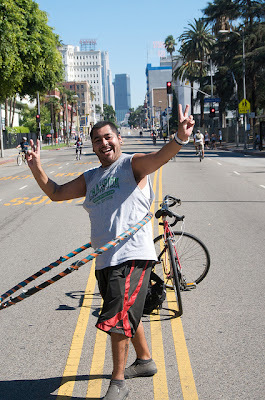 Photo Credit: Gary Leonard, CicLAvia. A block party event throughout the city of Los Angeles! 5.75 miles of roads closed to traffic! Ride your bike from end to end! The route changes at every CicLAvia. This route runs throughout downtown L.A.
My husband and son have participated in a few CicLAvia events and both said it was great! My husband recommends the event that kids be very comfortable riding because the atmosphere can be overwhelming, especially at intersections where it can get crowded. Kids who tend to weave back and forth on their bikes or are not experienced may end up crashing with other riders. You can read about CicLAvia safety here. You can purchase an MTA day pass and use the trains & subways to get around. My husband suggests not relying on bus transportation because there is only space on a racks for two bikes and every bus was full.